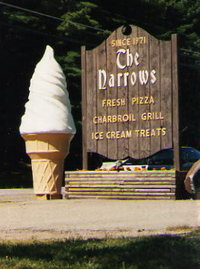 As far back as the early 1970s, we hear the Narrows Restaurant on Route 9 served a couple of generations, good food, cool ice-cream and a great time. Behind the counter the hospitality of Elza and Howard Urban and their family and workers made hungry travelers, locals and tourists feel welcomed, as they devoured their famous hot dogs and pizza while enjoying a round of mini golf. But nothing lasts forever and a few short years ago The Urbans moved to Arizona and closed up shop. Today and Sunday, you have the chance to own a piece of Narrows Restaurant history as the contents is put up for sale. A Facebook tribute page has some terrific memories from fans and employees. Our favorite is from Don DeZalia Jr., who has a funny story about an unusual pizza. I worked at the Narrows in 1971 when it first opened up. Remember Neil (Urban) creating a tuna fish pizza that was actually pretty good and can still remember Mrs Urban going over the paperwork with a bowlful of anchovies. 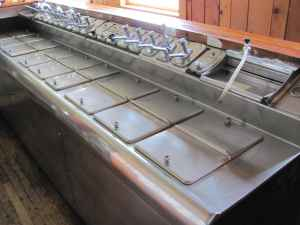 Among the items for sale: a ton of restaurant gear as well as a neon ice cream sign, an antique horse drawn hay rake and a vintage Bastian blessing ice cream cooler and ice cream fountain. Are you planning on going? Tell us about your visit or share your memories of the restaurant in comments.